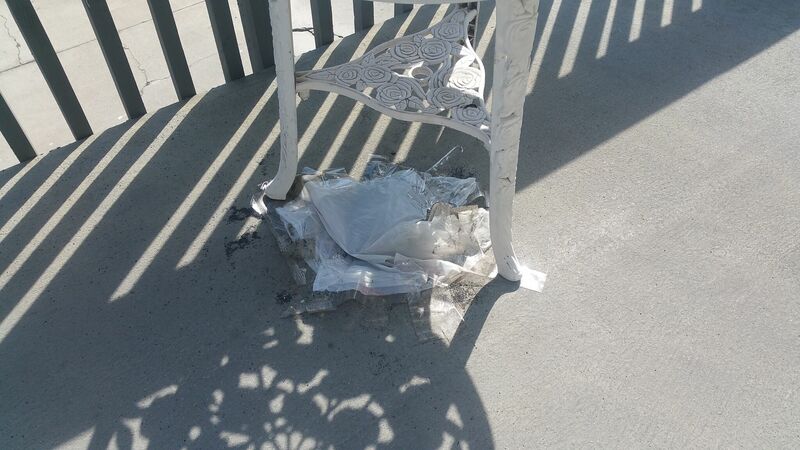 The resident at this multi-family dwelling called us because, not only did he have soft spots on his balcony deck, but his foot actually fell through one when he was walking on the deck (see the before picture with the plastic bag covering the hole). 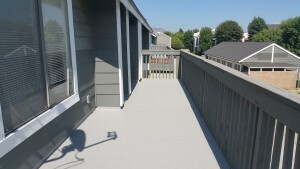 It’s important to keep in mind that once moisture penetrates the surface of a waterproof deck, it can cause wood rot and mold to proliferate under the surface. 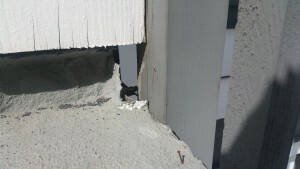 Too often, homeowners don’t notice until it’s too late, and damage is extensive. 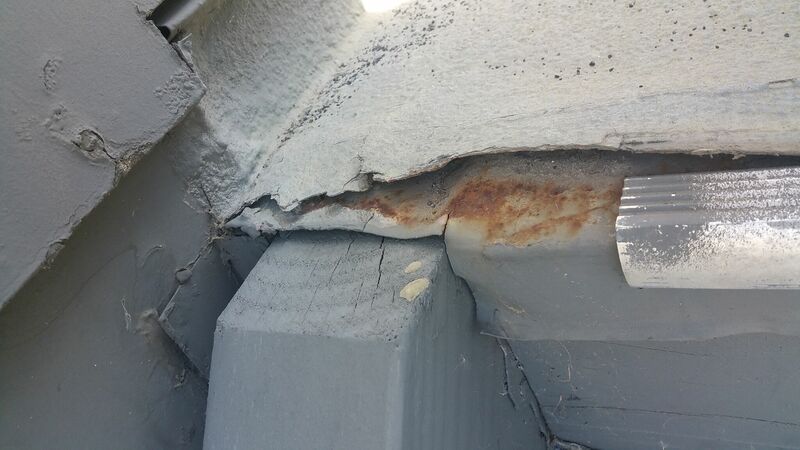 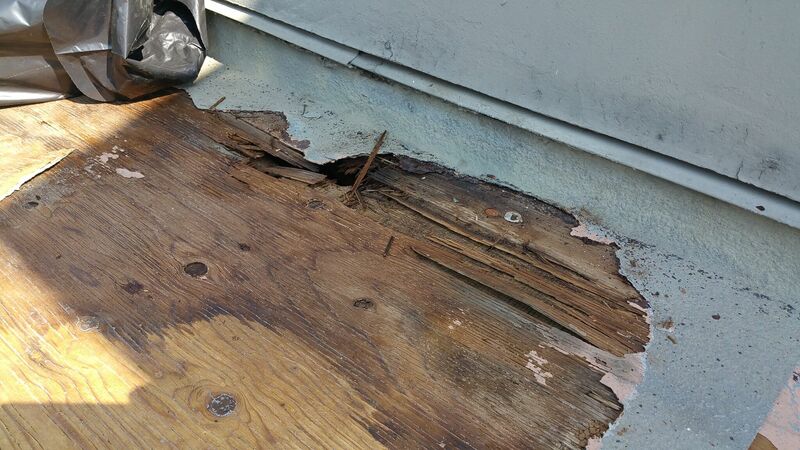 When we performed the inspection, we noticed that the waterproof deck coating system was very thin, and rusted plywood nails were popping up through the thin membrane. 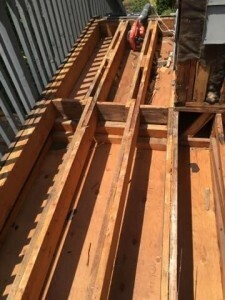 We found that plywood deck waterproofing system had been installed incorrectly: the waterproofing membrane consisted of fiberglass bonded directly to the plywood, without the proper texture and sealer coats. 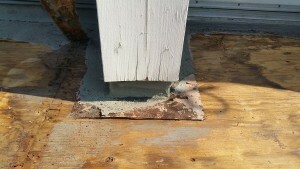 The original scope of work was to remove the existing coating, replace the plywood at the soft spots and install new Dexcelent II system. 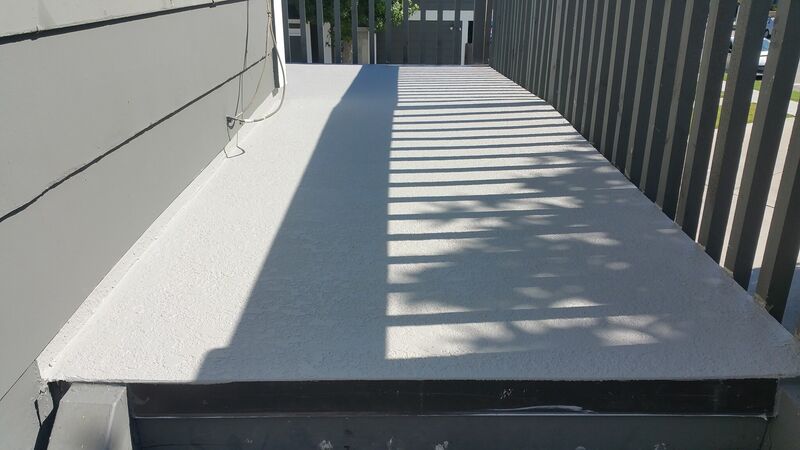 Dexcelent II is a Class-A fire retardant walking deck and roof covering system. 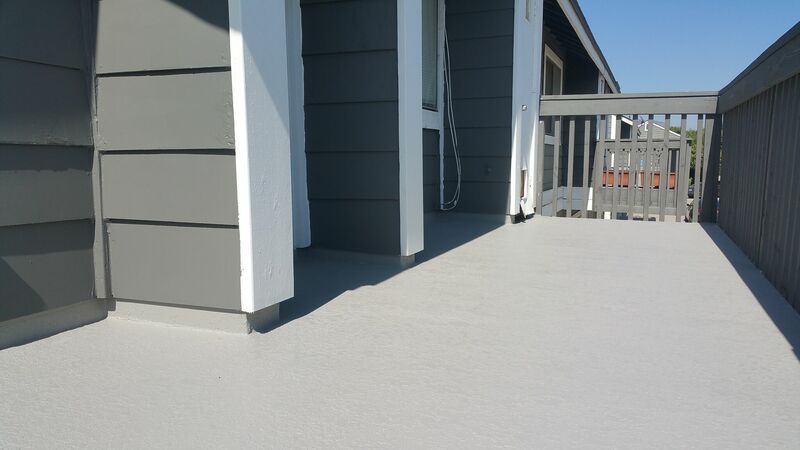 This multi-layer deck waterproofing system is designed for installation over plywood substrates, and is great product in terms of durability. 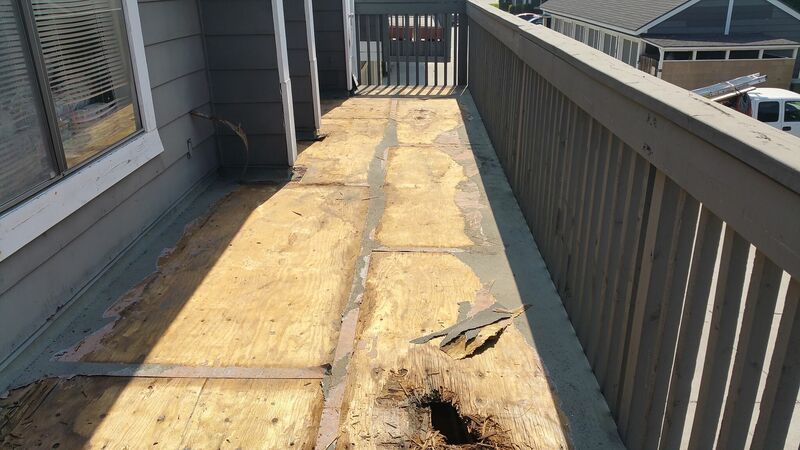 Once we started the process of removing the existing waterproof deck coating, we found that the plywood had lost all integrity. 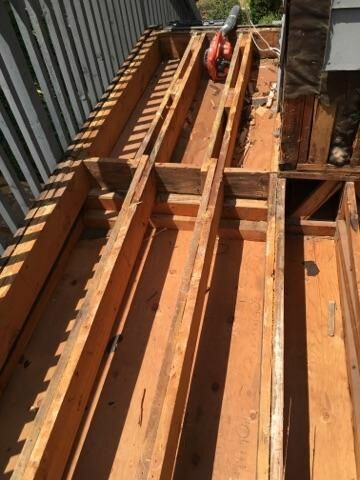 Even though it was not dry-rotted everywhere, it was so old and saturated with water that none of our staples would grab into the plywood. 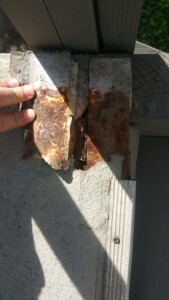 We also found that the deck-to-wall metal flashing was so rusted, that it caused the siding to deteriorate. So, we submitted a change order for removing and replacing all the plywood deck substrate, removing the damaged siding, and replacing the metal flashing. We ended up having to install new siding the bottom two courses because the old siding was completely deteriorated. 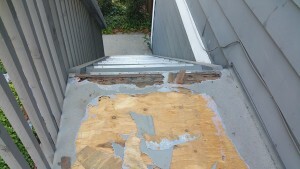 Fortunately, the structural beams were in good condition. Damage to structural beams can be costly to repair. We finished the job with new plywood substrate, new flashing, and a high-quality Dexcelent II deck waterproofing system. 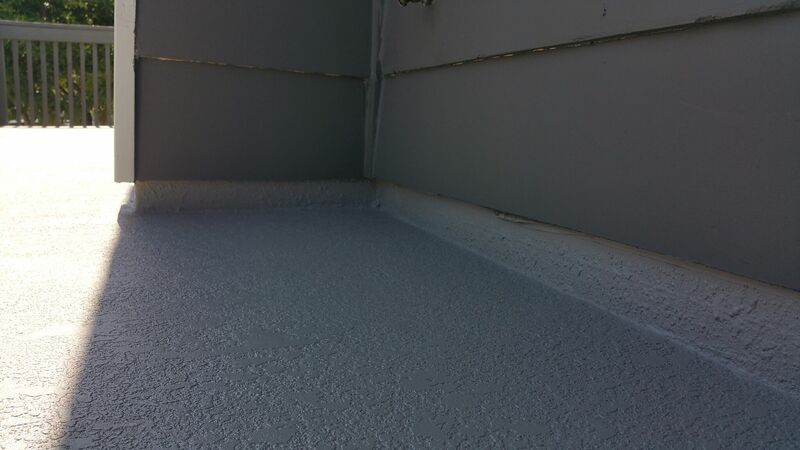 BEFORE: Waterproof coating peeling up where it meets the adjacent wall. BEFORE: Soft spots, and discoloration are visible from the surface. DURING: Plywood and siding are completely deteriorated. 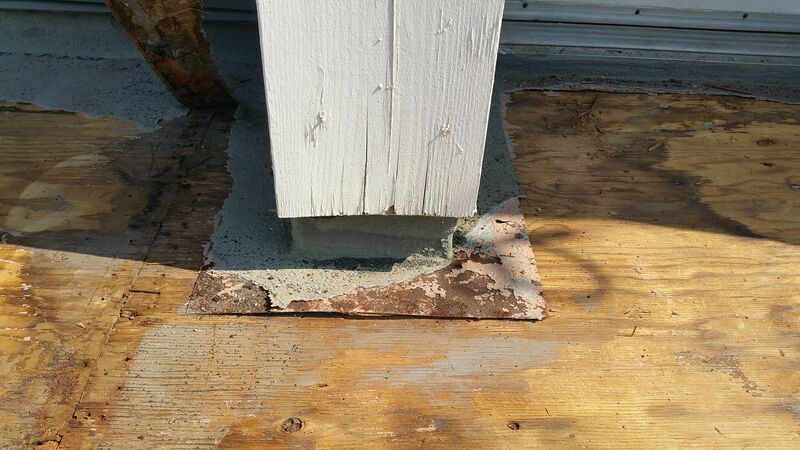 DURING: Rusted metal flashing due to water intrusion. 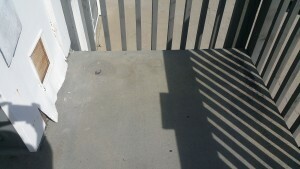 AFTER: Successful installation of new waterproofing system.